our perfectly imperfect life: Sasha. My girl. And the circus. Thank you so much to everyone who prayed for Sasha as he underwent open heart surgery this past Thursday. The surgery went very well and hopefully he will be moving out of the PICU today. Please continue to pray for a smooth recovery! Gotta brag on my girl real quick. We have been working with Payton for a long time on wrist rotation. A good example of that is opening doorknobs. I do believe it has been a blessing in disguise that she has not been able to turn doorknobs. Until now. This past week, she has mastered the art and now we're in for it. Now we need to figure out how to keep her out of the office (where she likes to empty drawers) and the nursery (where she likes to empty drawers). Do you see a trend here? We're about sick of putting things back in drawers. Sigh. But ... YAY for progress! 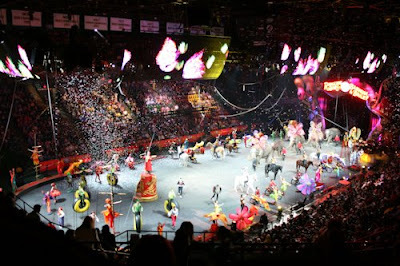 Earlier this week, we were given tickets to the circus from our local DS group. The kids had a lot of fun! I do have one gripe though. Could there possibly be an organized event that has more inflated prices for food and loot? Seriously. Shall I go on? I mean seriously. Those prices are so ridiculous. I think I can pay less than that at Disney World! Needless to say my kids got the $5 Barnum and Bailey flag and a thing of popcorn. Nothing more. Sorry kids! Ikwym, the circus is ridiculous. We have tickets for May. WTG, Payton! My answer for my kid when she wants something overinflated at a touristy gift shop or fair or circus or whatever -- I CAN BUY THAT AT THE DOLLAR STORE FOR ONE DOLLAR!!! Here's a solution for your nursery and office doors. Put those child covers over them. You know the kind that you have to squeeze while you turn the knob...the kind that I can't figure out! Then Payton can practice her nob turning and still not get in :)...granted if it was in my house I would also be locked out of those rooms too. I can't stand taking the kids to the circus because of that very reason. I hate saying no, no, no the entire time we are there. I even tried to give them each $10 to spend and they had to figure out it was a total rip off. Trust me Disney isn't a whole lot better but it is definetly more fun :). $9 for LEMONADE....you can make 12 gallons for $9!!!!!! Glad the circus was fun though! Did you have to pay $20 for parking too at the circus? UGH! Yes, seriously expensive! I am so glad the heart surgery went well, good to hear! Also, WTG Payton! Door knobs now, next...figuring out the door proofing! Ha ha!!!! WTG Payton, it really helps if you play to put in everything.